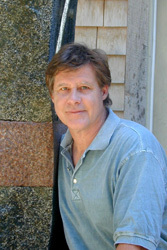 Gary Haven Smith received his Bachelor of Fine Arts from the University of New Hampshire at Durham. He has exhibited widely throughout the U.S., Japan and the Netherlands. 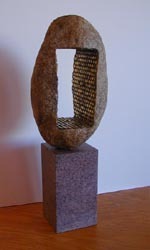 Smith's work is a part of many private and public collections including The Currier Museum of Art, as well as works completed for the New Hampshire Percent for Art Program. Most recently, he received an Enrichment Grant from the Greater Piscataqua Community Foundation. Smith is challenged by the massive, naturally occurring stone that surrounds his home. "The materials I choose and the designs created are reflections of past cultures." he says; "I try to achieve a format to look at our technological lives today and how it connects with the natural world we live in.